As each day passes in April the 2015 NFL Draft approaches, and with it so does our own assessment of the Steelers roster and depth chart relative to their needs in the draft. Today’s focus is the Steelers draft needs at inside linebacker. If there is one area of the depth chart where the Pittsburgh Steelers are truly set, it is inside linebacker. In fact, breaking down the Steelers starters at inside linebacker is hard because of that. The group is led by Lawrence Timmons, the first draft pick of the Mike Tomlin era. 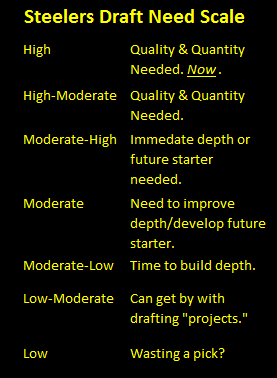 In truth, Timmons did not deliver much in terms of immediate value and his development was sporadic. Injuries ruined his rookie year. In 2008 Timmons showed himself to be a versatile backup at both inside linebacker and outside linebacker, and he forced Larry Foote off the roster. However, he struggled in 2009 as a starter, and even split time with Keyaron Fox. But Foote returned in 2010, but couldn’t shake Timmons for his starting spot, and Timmons blossomed into a stud. However, he did not play well in 2011, leading several to question the Steelers decision to renew his contract. Timmons has answered those questions. Since 2012 Lawrence Timmons has been the Steelers most consistent player on defense and arguably their best all around. He might not make the splash plays at the level of a Jack Lambert, Jack Ham, Greg Lloyd or James Harrison, but he’s around the ball, plays well and steps up when necessary as his hit on Jamaal Charles in the Steelers win over Kansas City shows. Opposite of Timmons the Steelers have…. Well it’s hard to say, because the starting duties were shared by Ryan Shazier, Sean Spence, and Vince Williams, all of whom made contributions and all of whom were playing well by the season’s end. Expect Shazier to win the starting job heading into 2015, but if he should falter the Steelers have not one but two men standing behind him. Sean Spence and Vince Williams really are “starters in waiting,” but the Steelers depth at inside linebacker goes beyond these two players. First they have of Terrence Garvin Bengals Sunday Night Football fame. Before making a name for himself on special teams, Garvin was working his way into the 3rd down package. 2014 Draftee Jordan Zumwalt will also return from injured reserve to compete for a roster spot. Arthur Moats can also do duty at inside linebacker, although his services are needed elsewhere. Like Wide Receiver, inside linebacker is an area on the depth chart which flipped in rapid fashion for the Steelers. On opening day 2013 inside linebacker was a glaring weakness. On the eve of the 2014 NFL Draft inside linebacker was markedly stronger. Today the Steelers depth chart at inside linebacker is clearly the team’s deepest, and therefore the draft priority status for inside linebacker for the Steelers in the 2015 NFL Draft can only be considered as Low. In 1998, defending a 27-3 lead, the Steelers begin the 4th quarter by fumbling at the 12, Keith McKenzie returns it 88 yards for a touchdown. The Packers score 17 unanswered points, but Pittsburgh holds on. In 2005, with Ben Roethlisberger, Jerome Bettis, and Willie Parker out, Charlie Batch throws for all of 65 yards and Duce Stanely runs for another 76. But the real offense is Troy Polamalu whose 77 yard fumble return keeps the Steelers ahead for good. Sunday’s game at Heinz Field lived up to tradition. At 6-0, Minnesota came to Pittsburgh as one of the NFL’s annual story book teams. Already armed with super-human Adrian Peterson at running back and an unforgiving defense, newly arrived 40 year old Brett Favre has shown that he still as enough late-game heroics left in him to transform the Vikings. When the last Minnesota team with Super Bowl aspirations visited Pittsburgh in 1989, the Steelers exposed them as pretenders. With Brett Favre, they arrived today as contenders. In spite of the Steelers 3 game winning streak they entered the game to a chorus of questions, the most pointed of which was: Can the Steelers defense close? But the Steelers defense had it where it counted and when it counted. They not only held Brett Favre’s high octane offense to 10 points, they also put up 14 of their own. Those were the only two stats that mattered. Credit Brad Childress, Adrian Peterson, and Brett Favre for having their troops fired up and ready to go. Most experts expected a high-flying shoot out. Instead the Steelers and Vikings gave the fans every bit of their money’s worth in a hard hitting slug fest. From the get go, this one had the feel a game that would come down to who wanted it the most. For that reason, while the Steelers two-touchdown plays will rightly make the highlight reels, the key defensive stand for the Steelers perhaps came on the Viking’s first possession in the third quarter. Favre took his team 65 yards to the Steelers one, gaining the lion’s share of his yards on a 35 yard pass that Troy Polamalu, and only Troy Polamalum prevented from becoming a touchdown. Give an offense with the NFL’s best rusher a legendary quarterback a 1st and goal at the one and what happens? Most people would assume that is an easy six. Privately, most defenses would have conceded as much. The Steel Curtain showed they were more than a match for two Adrian Peterson runs and two Favre throws from the one. The other key series came at the end of the first half, when Ben Roethlisberger drove the Steelers 8 plays with a minute 39 remaining to land a touchdown with a 40 yard scoring strike. On a day when balance and rhythm eluded Bruce Arian’s offense – Rashard Mendenhall averaged 6.9 yards a carry but only got the ball ten times. The Steelers offense created and then seized their own opportunities. Fan of course will rightly remember this game because LaMarr Woodley and Keyaron Fox put on a clinic on seizing on opportunities. Never let it be said that Bob Ligashesky’s special teams are not generous. On Sunday they were kind enough to let the Vikings right back in the game (that’s 21 points off of special teams in 7 games) after Woodley’s touchdown. With 3:21 remaining, Favre drove his team down the field again and it looked like he was about to pull out one of his patiented come from behind wins. A routine dump-off to Chester Taylor looked to bring them closer. 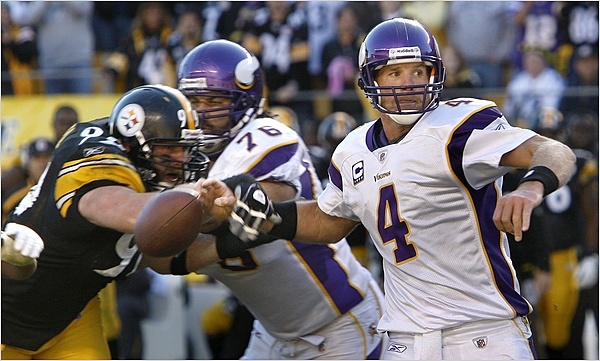 But strange things happen when Favre shares the field with the Steelers and it was Keyaron Fox’s time to strike. The victory over the Vikings gives the Steelers a 5-2 record heading into the bye week. But on Sunday the Steelers proved they can defeat a contender. *The uncanny streak followed me down to Buenos Aires. I was out watching a game of the Argentine American Football Association, and my wife realized that something funky was up with Direct TV Plus — she made sure the game got recorded — hence I have nominated her for a game ball.